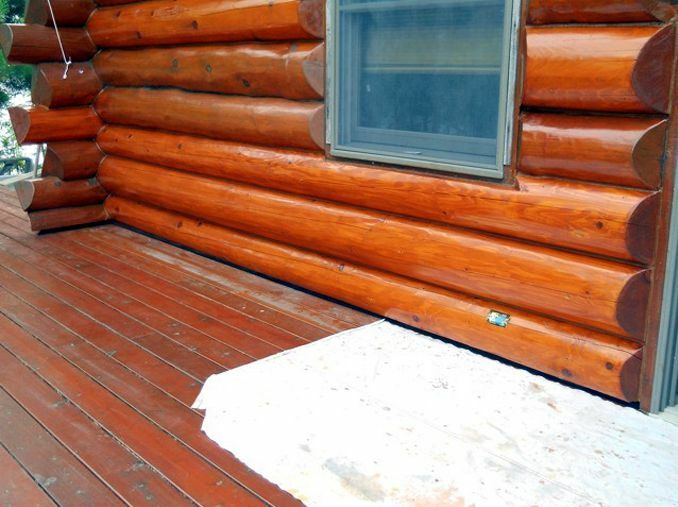 This log home is located in northern Minnesota near Ely where wet summers provide the perfect condition for rot. 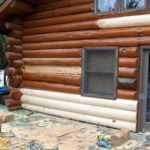 The owners of this lake home knew they had a problem with log rot but had not been able to find anyone locally who was willing to take on the project. They did an Internet search and found Edmunds & Company. Though we are located in Wisconsin, we also work all over Minnesota. Early in the spring, we met with the owners and made a plan to complete the work. The fact that the home is situated on Lake Vermillion means that it is exposed to some serious weather conditions and this gable wall has to withstand the brunt of this. The new logs blend in well with the rest of the logs. 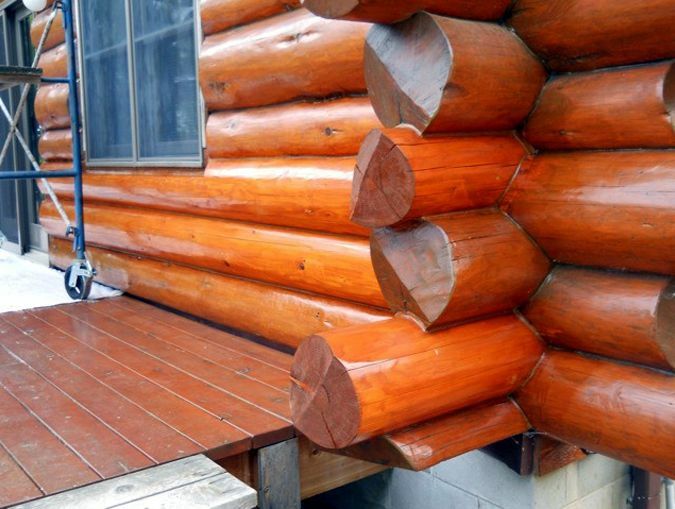 Half-log replacement complete, as well as a couple of crown log ends. The rot has been cut out of these three logs. 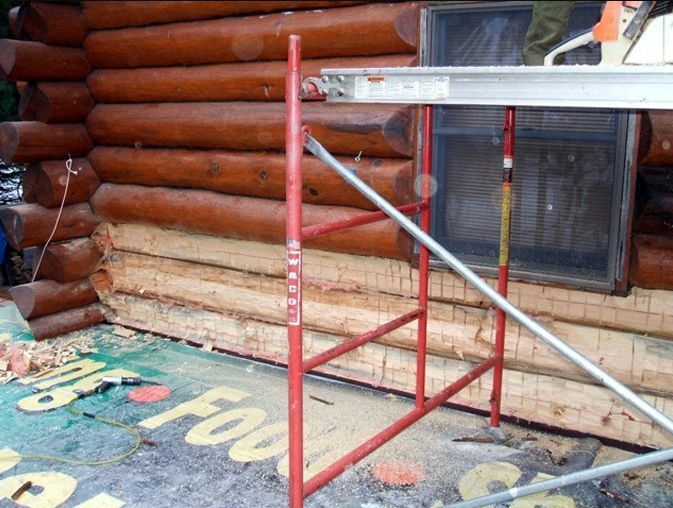 The logs are ‘refaced’ using half-logs. 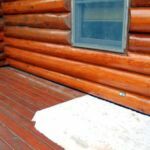 We used dried cedar for our replacement logs because of their rot resistance properties. Notice the careful caulking around the crowns. 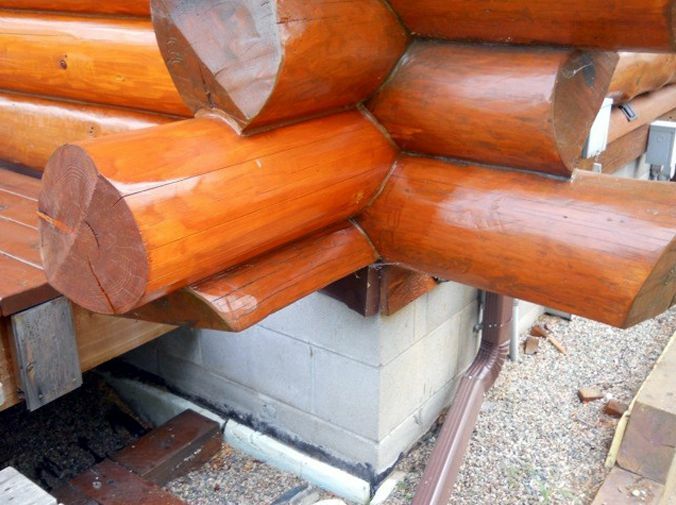 Unfortunately, this home had many rotten logs that needed replacing. 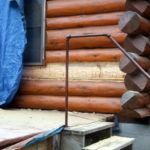 It had fallen prey to a classic problem with log homes: Water from rain had splashed up onto the bottom logs and the continued exposure to moisture set the stage for rot. 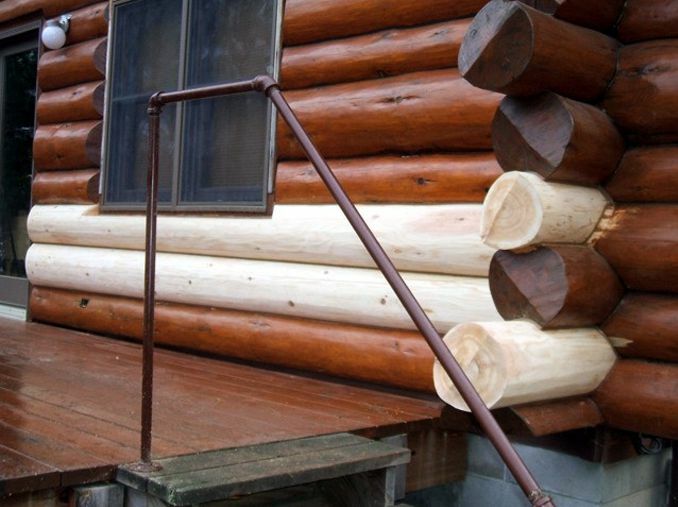 Edmunds & Company uses dried cedar logs as our replacement logs primarily because of their resistance to rot. 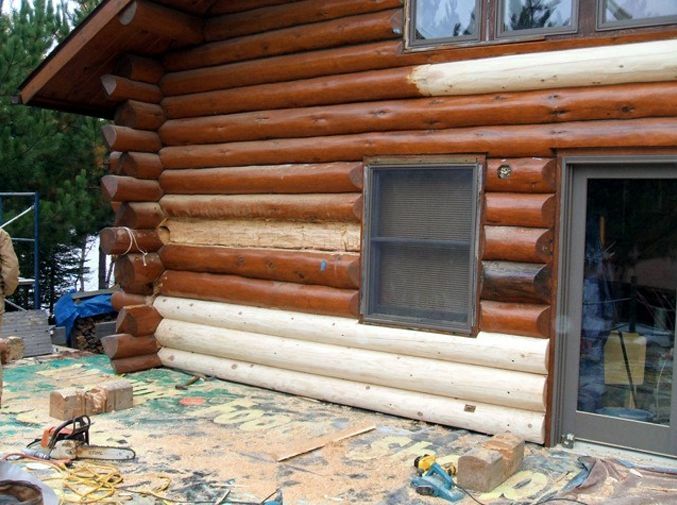 The rotten portion of the log was cut out using chainsaws and a new half-log was cut to fit. This process is also called “re-facing” a log. 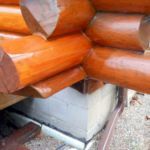 Most times, rot is caught before it goes more than 50% into a given log so the interior part of the log stays in tact. 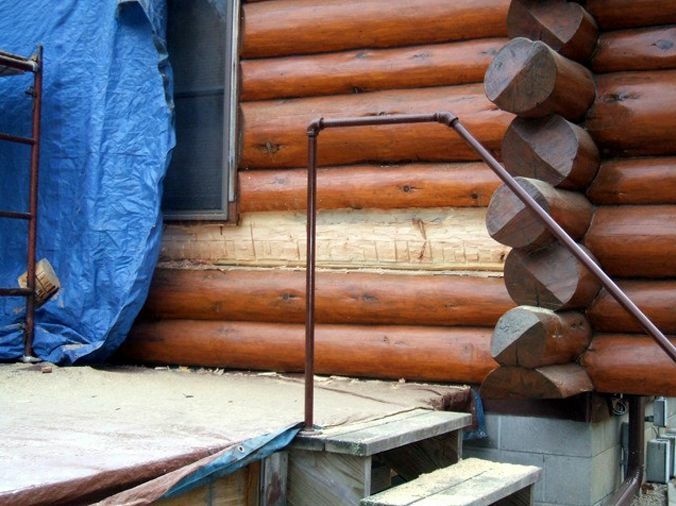 Re-facing or installing half-logs is the type of work Edmunds & Company does nearly every day. 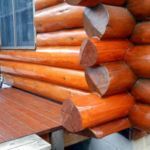 Let us help you repair the rotten logs in your log home. 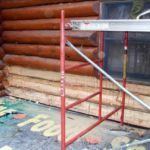 We guarantee our log work for 10 years. 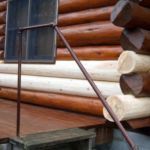 The Twin Cities of Minneapolis and St. Paul are areas we often find ourselves doing log repair and restoration of log homes….